When Pope Francis, Rabbi Abraham Skorka and Muslim leader Omar Abboud embraced each other at the Western (“Wailing”) Wall in Jerusalem on May 26, the last day of his pilgrimage in the Holy Land, they sent a powerful message of peace to the followers of the three monotheistic religions, that count for almost two-thirds of the world’s population. The authenticity of this original and far-reaching gesture is beyond doubt; they have been friends for many years and share together a common vision. They belive that men and women of the three great Abrahamic religions can live together in peace and work together for the good of the entire human race, if the obey God’s will. The first Latin American Pope wanted that embrace to take place here in Jerusalem, after he and his two friends had visited the various sites that are holy to each other’s religion. It was one of the strongest gestures that he used, and with maximum impact to his global audience, during his three-day “pilgrimage of prayer” in the Holy Land. This and many other gestures were transmitted worldwide by the more than 1,000 reporters from TV, radio and the print media who had come to cover his visit here. The embrace at the Wall was perhaps the most significant gesture of his whole visit to the Holy Land, but it was not the only one. His warm embrace with the Ecumenical Patriarch of Constantinople, Bartholomew 1, the “first among equals” in the leadership of the second largest Christian Church, before entering the Basilica of the Holy Sepulcher in Jerusalem on May 25 is another one that stands out. It was one filled with significance for Christians of all denominations on their journey towards unity. I watched them embrace as the sun was setting, and then observed the gentleness, care and tenderness with which they related to each other throughout the hour-long ecumenical ceremony in the basilica in memory of the historic embrace of Pope Paul VI and Patriarch Athenagoras on 5 January 1964. It was a prolonged gesture, that began outside the basilica and continued within. Their love as brothers in the Lord was not feigned, it was authentic and visible for all to see. It bodes well for the future of the Catholic-Orthodox dialogue. On that occasion, the Pope and Patriarch used strong words of commitment to unity to reinforce their action; words that expressed their heartfelt desire to overcome the almost one thousand year division between their two Churches. Francis used a particularly strong image from the Resurrection story when he spoke. He reminded his distinguished audience, that included representatives of all the Christian Churches in Jerusalem, that just as God removed the rock from the tomb of Jesus, so too the rock of divisions between the Orthodox and Catholic Churches can be removed too if they truly listen to what the Spirit of God is saying to them today. Another significant moment (it was a gesture, but not just that) came when, in the meeting with Muslim leaders at the Esplanade of the Dome of the Rock, on May 26, Pope Francis Pope called them “brothers.” It was his tradition in Argentine to call Muslims “brothers,” Paul VI – on a few occasions, and John Paul II in a number of speeches opted to call Muslims “brothers” rather than just friends. Francis is now using that important word all the time when he meets Muslims, and for this too the followers of Islam esteem and respect him. 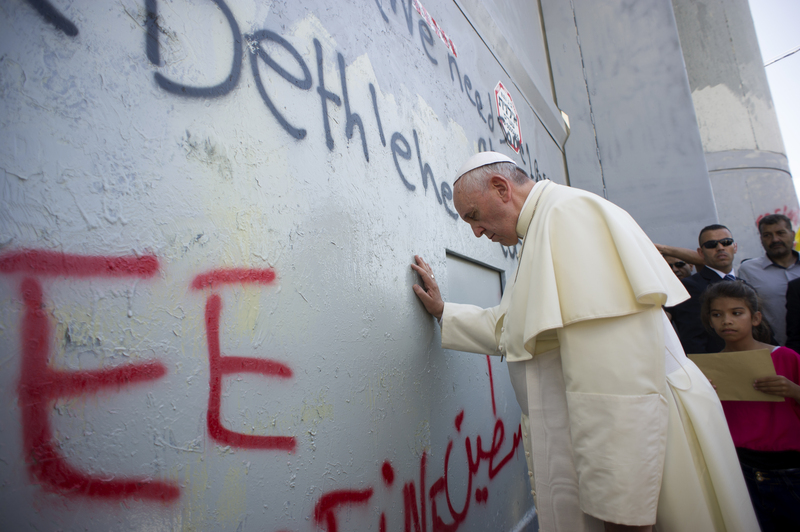 Prior to those two preeminent gestures and the courageous and creative initiative to invite the Presidents of Israel and Palestine to join him in the Vatican to pray for peace, Pope Francis, on the previous day – May 25, acted in a way that has had a major impact on all Palestinians as well as Muslims throughout the Middle East, when he got out of his jeep on his in Bethlehem and prayed at the Wall that separates Israelis from Palestinians. Over the years it has become a symbol of the deep divisions between them, and is an ongoing source of resentment and hatred. Francis is a Pope that advocates the culture of encounter, and rejects the culture of confrontation. His prayer at the Wall was a strong gesture in total harmony with that vision. He wants to eliminate hatred from the hearts of people, and educate them to mutual respect for each other as sons and daughters of the One God. He is not afraid to challenge and disturb people. He believes “in shaking things up,” and giving new hope to people. His prayer at the Wall, however did not go down well with many Israelis. Pope Francis who has excellent political antennae realized this and so, on the following day, he acceded to a request from Prime Minister Nethanayu to pray at the memorial to the civilian victims of terrorism in Israel. He showed no hesitation in doing so because he is convinced that as a pastor, and follower of Jesus, he must participate in so far as is humanly possible in the sufferings of others, whether they be Israeli or Palestinian. Among the many other remarkable gestures that marked his Holy Land trip, one can mention his particular gestures of kindness and tenderness when he met 600 refugees from Syria and other countries, many with disabilities, at Bethany beyond the Jordan, on May 24, and the next day when he visited Palestinian refugee children at the Dheisheh refugee camp outside Bethlehem and greeting each one of them. His eloquence was particularly striking again at Yad Vashem where he delivered a profound reflection on the evil that man can do to his fellow-human beings when he misuses his liberty, does evil and thinks he is God. It was a meditation that resembles the Psalms. He composed it without any assistance. It applies to the Shoah, but also has universal significance. The above mentioned gestures together with his brief, challenging and inspiring talks given during his “pilgrimage of prayer” in the Holy Land, have opened new horizons for Christians, Jews and Muslims in the Holy Land, and raised the hope that the peace is still possible in this land that has lived for far too long in the darkness of conflict and division.